Ill health has forced FCA’s CEO to leave early. Successor Mike Manley runs Jeep, its most profitable brand and core to Fiat Chrysler’s five-year plan. That provides continuity. 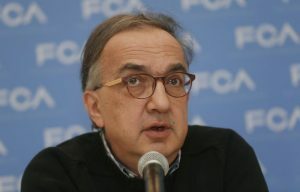 But without jumper-wearing Marchionne, Fiat’s independent future may be harder to guarantee. The search firm can easily cover the EU’s $5 bln fine for using its Android phone system to stymie rivals. But the order to stop forcing handset makers to pre-install its software could clip innovation. Plus: Goldman Sachs and Tesla put lackluster corporate governance on show. The Chinese battery champion will build its first factory abroad in Germany after scoring a $5 bln supply deal with BMW. It establishes a base in a promising market for electric vehicles. The newly listed company is cementing its lead over compatriot Warren Buffett-backed BYD. Absorbing new tariffs on U.S. cars would probably have killed any chance of CEO Elon Musk hitting his goal of a profitable second half. Ford can soak them up. Strategically, the balance is different: Ford needs new ideas, while Tesla just has to get on with building a factory. Elon Musk had to pull out all the stops to hit his oft-postponed Model 3 production target. It will cheer his faithful followers and make it easier to raise capital. But for the electric-car maker to really cruise, he must prove he can sustainably increase output and make money. The British giant is spending 1 pct of its $16 bln capex budget on battery-powered vehicle chargers. That’s unlikely to protect against a drop in crude demand. But after writing down most of its last $8 bln push into new energies, investors doubt BP can reinvent itself. A subsidiary of property giant Evergrande has agreed to bail out a troubled U.S.-based Tesla challenger. Faraday Future’s Chinese founder Jia Yueting gets breathing space, but why Chinese or U.S. regulators would clear this deal is a puzzle. Investors may be celebrating too soon. Tesla’s boss says an employee tried to “sabotage” the firm and thinks rivals, energy firms and short-sellers are out to get the $60 bln electric-car maker. He’s partly right, but it comes with the territory for someone who wants to overturn the industry with his radical vision. Cutting 9 pct of workers won’t tip the $60 bln electric-car maker into profit. Even if it halved its sales and admin budget it would probably still lose money this year. There’s a message in the economizing, though: boss Elon Musk is eyeing small things, not just the big picture. CATL shares rose by the maximum 44 pct in its market debut. While such ardour is common in China’s frothy markets, the $12 bln local champion could live up to high expectations. Its success will also rev up demand for the next listings that ride the global electric vehicle boom. A tiff about moats and candy has reignited the friction between the two billionaires. Think like a Warren Buffett investor, and Elon Musk’s Tesla is the epitome of a terrible investment. But the two do have common ground. And betting against either of them requires guts. Beijing has set deadlines to lift JV rules for foreign automakers. Ford and Daimler will be pleased, but Elon Musk's embattled $50 bln electric-car maker should benefit most. Freed to enter the biggest market without having to share technology, Tesla's risky strategy may pay off. A $4.5 billion backdoor listing offers the first pure play on China’s new energy auto market. Beijing Electric Vehicles leans heavily on subsidies and patronage - a precarious position as the central government reworks support for the sector. Its alliance with Daimler might help. The Chinese carmaker's founder has bought a 10 pct stake in Daimler, parking it next to Volvo, Lotus, London cabs and Swedish trucks. It's another strange turn in Geely's route to global growth. This new $9 bln part will be hard to fuse onto what has otherwise been a sweet ride. Despite revenue rising 15 pct last year and a cost-saving alliance with Japan’s Nissan, the carmaker trades at a discount to rivals. Selling more cars and boosting margins will help, but the French government’s 15 pct stake is the main obstacle to CEO Carlos Ghosn boosting value. The entrepreneur bagged some good PR for his other firms by putting a Roadster into space and selling flamethrowers. He also broadened Tesla’s funding mix with a securitization. But with some $4 bln of cash set for incineration this year, the carmaker needs to sell more stock.